Thermofoil doors are very commonly found in kitchens, bathroom vanities, closets, and other home organization furniture. Thermofoil cabinet doors are made from synthetic veneers laminated on fiberboard to give the look and feel of real wood without cutting down any trees. 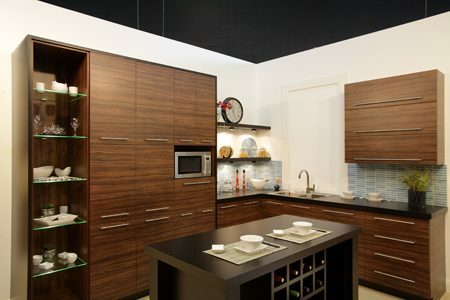 You can find thermoformed doors at retailers of kitchen cabinets, closets and furniture dealers. Professional installers in your local market, known as refacers, can come out and exchange your cabinet doors for a new and fresh look, at a fraction of the cost of a new kitchen. Refacing replaces your existing cabinet doors for new doors of your choice. They also use laminates, or synthetic veneers, to refinish all the exposed sides. In a very short period of time you can have a new kitchen without having to replace floors, countertops or the existing cabinet boxes. That means: no extra plumbing or electrical costs. Cabinet refacing can cost half as much as a new kitchen while giving you a brand new kitchen look – in about half the time! Thermofoil is the abbreviation of rigid thermal foil PVC films vacuum formed or membrane pressed to create a 3D formed part. Typically used to make doors but thermoforming can be used to make any 3-dimensional component. Thermo-pressed doors will have a 3-D design compared to other laminates.